I’ll admit, mahjong matching games don’t usually get me all that excited. They’re about half a step up from match-3 games in the overcrowded puzzle world, but I have to admit that Random Mahjong is definitely one of the slicker versions I’ve seen. If you’ve never played a mahjong matching game before, I’m surprised, but it’s very easy to learn. All you have to do is pair tiles to remove them from the board, and the goal is to clear the board completely. The challenge is that you can only remove “open” tiles, which means tiles that are clear either on the right and/or left side, with no other tile on top of it. There are also 4 tiles in a set, so if you accidentally remove a pair, but the other 2 are stacked on top of each other, you’re stuck. Visually, Random Mahjong is fantastic. The tiles are crisp and clear, and the backgrounds are really quite lovely. There aren’t quite as many visual options as the Shanghai Mahjong app, but for elegance and overall aesthetic polish, Random Mahjong is tough to beat. But despite being one of the more attractive mahjong apps around, but the big draw here is the promised “random” of the title. 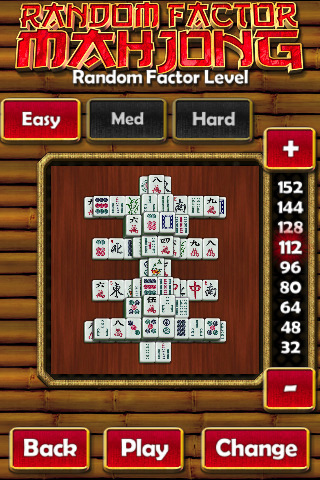 More than just a set series of levels, Random Mahjong comes with a random level generator, which means every game is different and customizable. You can select the number of tiles you want and the difficulty, and the app will generate a fresh board for you. The starting forms are generally a little irregular, but every board is solvable, and the gameplay is basically identical to any other mahjong matching game out there. In addition to creating random single boards, Random Mahjong also lets you play progressive levels. You start with the fewest number of tiles, and if you complete the level, a new board is generated with the next higher number of tiles. You have three lives initially, but you can earn extras by completing boards on your first try. When you run out of matches, unsurprisingly, you lose a life, and the board regenerates to its starting form to give you another shot at it. Overall, it performs very smoothly and delivers a solid experience, but it’s missing a few things you might expect. For one, there is no undo button, so no mistakes allowed. You also can’t restart a level in the middle, even if you can see that you messed up somewhere and have no way of winning. I actually found this the most frustrating aspect. There is also very little music and no way of playing your own. I vastly prefer little to no music over bad music, so that part didn’t faze me much, but the option of playing my own wouldn’t have gone amiss. As mahjong games go, this is a very nice one. Although it doesn’t bring anything new to the genre aside from a polished interface and infinitely replayable gameplay, that’s enough to make it stand out from the crowd in a significant way. It’s not an exciting or original game by any means, but it is a sleek and attractive take on a familiar form. 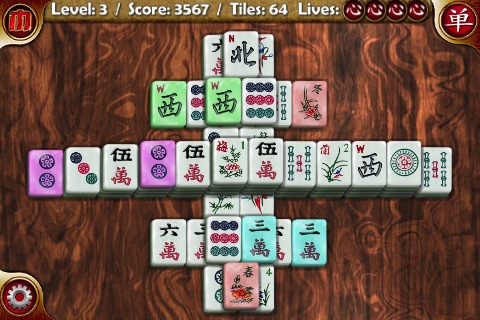 AppSafari review of Random Mahjong was written by Tracy Yonemoto on October 24th, 2010 and categorized under App Store, Board, Games, iPad apps, Puzzler, Strategy, Universal. Page viewed 3628 times, 1 so far today. Need help on using these apps? Please read the Help Page.